Future of the Series: Unfortunately, I think the series ends with Grave Concerns, as Gwen Hunter has two successful urban fantasy series that she publishes under the name Faith Hunter. I think she is having too much fun with those series and I don’t see that she would be interested in going back to the medical thriller, but you never know. 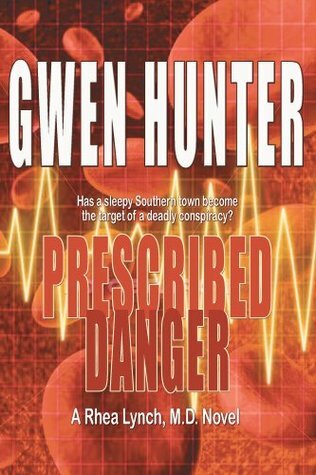 Gwen Hunter’s Dr. Rhea Lynch series has actually been out for a while with the last novel of the series being published back in 2004. Recently the series has become available on Kindle and with it a whole new generation of medical thriller fans following the series which includes me. The series is set in Dawkins County which is in a rural part of South Carolina and with it a flavor of good ‘ole Southern charm. Dr. Rheane Rheaburn Lynch is an emergency room doctor for Dawkins County’s small hospital which creates a challenge for Lynch as the facilities are not quite up to the standards of hospitals in the big city. Lynch’s family line resides with the Charleston Rheaburns, an established “old money” family who disinherited and ostracized Lynch’s mother because she had married a man beneath the family status. Lynch’s father died when she was young and her mother turned to booze, so her early childhood was difficult until she met her childhood friend Marisa who had a significant positive effect on Lynch’s life. Lynch’s other significant relationship had been with John Micheaux, a fellow doctor who chose his upper crest family over his relationship with Lynch. Also, throughout the series, Lynch develops a fragile relationship with Mark Stafford, a local cop. 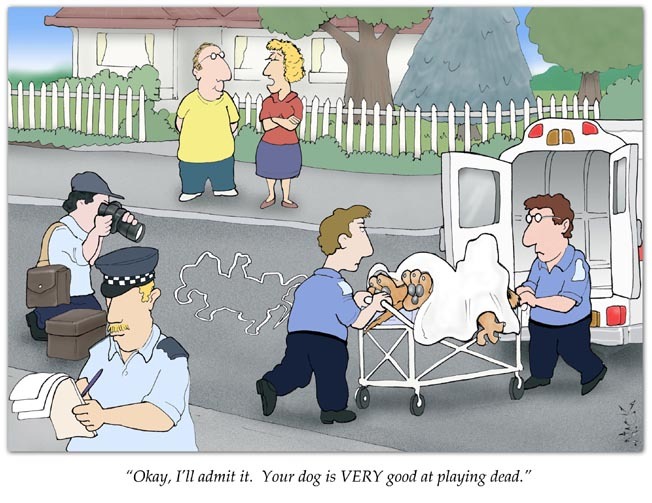 Most of the excitement of the series revolves around the events that occur in the emergency room. Lynch is reluctantly drawn into adventures that she would normally like to avoid but her persona as a physician and saving a life often takes precedence over her own safety which gets her into a whole heap of trouble. 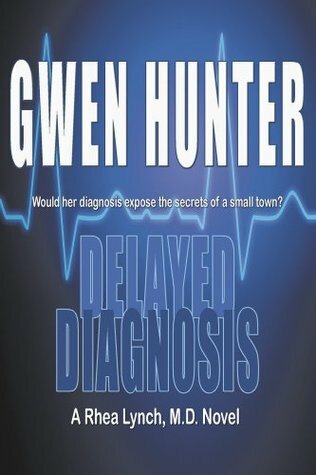 Hunter’s Dr. Rhea Lynch series is a rare find in the fact that Hunter develops highly rich characters within the thriller genre, which is difficult especially in medical thrillers. Usually authors of thrillers have a difficult time finding a balance between making their characters complex and at the same time build a compelling suspenseful plot, but Hunter has a gift at doing both. The other positive aspect of the series is that Hunter does not hold back with the medical terminology which is often lacking in many medical thrillers. It really feels like you are in the ER right along with Lynch and her staff. 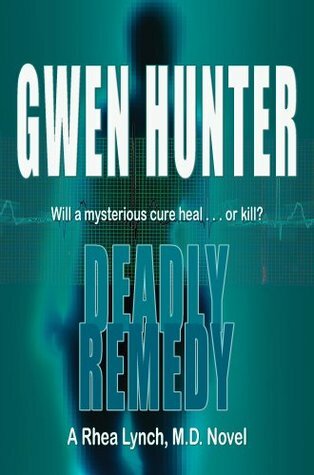 For lovers of medical thrillers, this series will be just what you are looking for and a great read. For dog and cat lovers, Lynch’s relationships with her two dogs, Belle and Pup, along with her cat friend, Stoney add an additional level of warmth and love to the series. 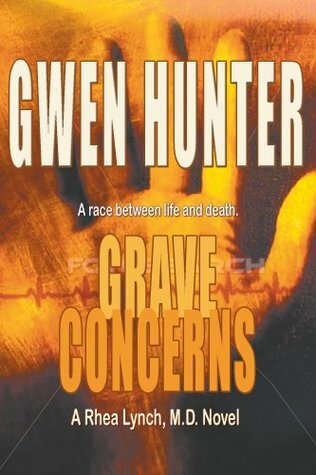 Unfortunately, I think the series ends with Grave Concerns, as Gwen Hunter has two successful urban fantasy series that she publishes under the name Faith Hunter. I think she is having too much fun with those series and I don’t see that she would be interested in going back to the medical thriller, but you never know. It would be best if you read the series in order. 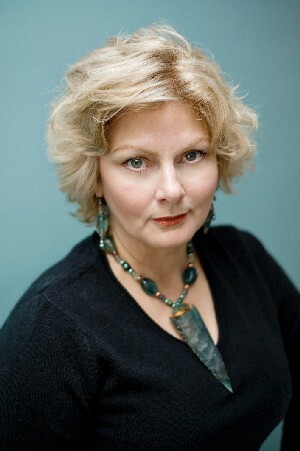 Hunter also has a standalone novel entitled Ashes to Ashes which could be considered as a prequel to the series. It does not include Lynch but it has the same setting and centers around Ashlee Davenport, Lynch’s favorite ER nurse. What about the science? In her early days of writing, Hunter worked in a medical laboratory to help her cover her expenses. Having access to emergency room staff, I am sure that is where she picked up most of her medical knowledge. The Rhea Lynch Technical Word in Review: Henbane- also known as black henbane, stinking nightshade, juniper-bean, henbell, cassilago, cassilata, bazrolbang, insane root, devil’s eye, poison tobacco, or under its scientific name Hyoscyamus niger. It has been used for centuries as an herbal medicine but has also been known to be an effective poison. Henbane contributes its pharmacological properties to a number of alkaloids with hyoscyamine and scopolamine being the primary culprits. 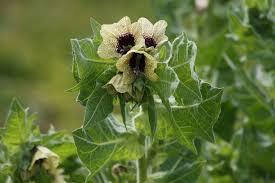 Medicinally, henbane under controlled conditions can act as an antispasmodic, a mild analgesic, and a sedative. However, when overdosed the alkaloid scopolamine will induce excessive sleepiness later followed by extreme restlessness, hallucinations, delirium and manic episodes. With excessive overdose respiratory arrest, convulsion, coma and occasionally death can be expected Alizadeh, A et al. Cameron (Cam) Reston: Fourth year Duke University neurosurgeon resident, friend of Rhea’s. Dr. Rhea Lynch left a suffocating life in Charleston to practice medicine in the ER of a small South Carolina hospital. Now Dawkins County is her home, a place that holds the only real family she’s ever known. But when she returns from vacation, Rhea is shocked to discover her best friend, Marisa, near death and unable to communicate. The official diagnosis: a paralyzing stroke. Despite the family’s attempts to keep her away, Rhea is determined to make her own diagnosis. In an illicit examination, a hideous truth is revealed. Then a man is brought into her ER with similar symptoms. And then another. Each one of her patients has been willfully, brutally, silenced in a most inhuman way. Desperate to find answers, Rhea must determine who she can trust, as a powerful conspiracy threatens the people she loves — and perhaps the entire community. According to my mother, I had breeding, good genes, and the right to success. Working in the E.R. of a small South Carolina hospital, Dr. Rhea Lynch has seen it all — most of it at 2:00 a.m. But when an interracial couple is rushed in, beaten and bloodied by a mysterious hate group, the patients show symptoms of a fast-acting pulmonary infection Rhea has never seen before. Within hours, it proves fatal. How could something like this have happened in this peaceful community? Can it be stopped? Every second counts as Rhea desperately tries to fit the pieces together — and soon realizes that she is dealing with something bigger and more terrifying than she could ever imagine. I never put much stock in omens and portents, but that strange August Wednesday had been rife with them, according to Miss Essie, who knew more about such things than I ever would. Will a mysterious cure heal . . . or kill? As a physician in the E.R. of a rural South Carolina hospital, Dr. Rhea Lynch is a dedicated healer, a woman of science and, to some degree, a skeptic. But her most fundamental beliefs are put to the test with the arrival of a traveling faith healer, whose “cures” produce some baffling mysteries: a young quadriplegic woman can suddenly move her arms. A chronic pain sufferer begins to dance again. Events go from bizarre to deadly with the arrival of a gravely injured but violent young woman determined to practice a dark, deadly magic. As the pieces of this puzzle begin to fall into place, Rhea will find her beliefs, her skill and her understanding tested in unfathomable ways as she enters a realm where science and strange faith collide . . .
As an ER doctor I’ve seen a lot of patients die-pass on as we say in the south-but some deaths are worse than others. Life in a small town can take some interesting twists–especially for ER physician Dr. Rhea Lynch. When the chief coroner is shot in a hail of gunfire that leaves a man dead and a teenaged boy searching for clues to his missing sister, Rhea is deputized as an assistant coroner. Then a mass grave is discovered–along with a killer’s baffling clue. Although she is a doctor dedicated to saving the living, Rhea is suddenly forced to find answers from the dead. Soon her skill and courage put her back on the front lines of the battle she fights best: a race between life and death. Many series are being made into movies or television programs. If you are like me, you probably imagine who you would like to play the lead role. So who would you pick to play Dr. Rhea Lynch? My choice would be Anne Hathaway.